Exciting times are ahead for a new junior league launched in Fareham. The league provides girls the chance to play netball outside of school. And the hope is they will continue playing as they get older. That was Helen Dunning’s aim when she and Dee Parker created All About Netball’s first ever junior league. 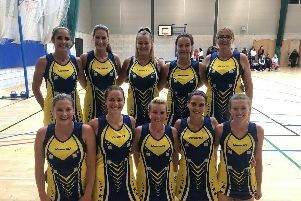 ‘We have had a great first season with teams from Fareham Fireflys, Gosport Gators and Shooting Stars coming to join us,’ said Dunning. In the under-12s, Fareham Fireflys Purple were champions with the best and fairest players going to Jasmyn (FF Purple), Alice (FF Black) and Stevie (Shooting Stars). ‘I would particularly like to thank Katie, Amy and Georgia for their fab umpiring in the under-12s division,’ added Dunning. The under-14 division saw Fareham Fireflys Aqua come out on top with best and fairest players Charlotte, Kitty, Isla, Hameen, Lauren and Gemma. The All About Netball league was formed back in September 2013 by Dunning and Parker as a way of getting new teams and players involved in netball. The league now includes two adult divisions on a Monday as well as the junior league running on both Tuesdays and Thursdays. Dunning said: ‘We had joined another social league with our club and just felt this could be improved upon so we took it on. ‘We’ve grown from four teams to 21. ‘Thank you to all of those people who have supported us through those cold winter nights. ‘Let’s hope the weather is kinder to us in the summer. ‘Also a special thanks to all of the coaches, managers, supporting mums and dads and, of course, the players. The new season will start again in March. Contact Helen Dunning on alwaysflowers@hotmail.com or 07745 110119 for more details.